To install contentACCESS, first download and run the setup package (contentACCESS X.X Setup.exe). As default it unzips to C:\TECH-ARROW\contentACCESS_Package folder, but you can use the Browse button if you want to change the directory. Click Unzip. After the files have been successfully unzipped, click OK. Welcome! 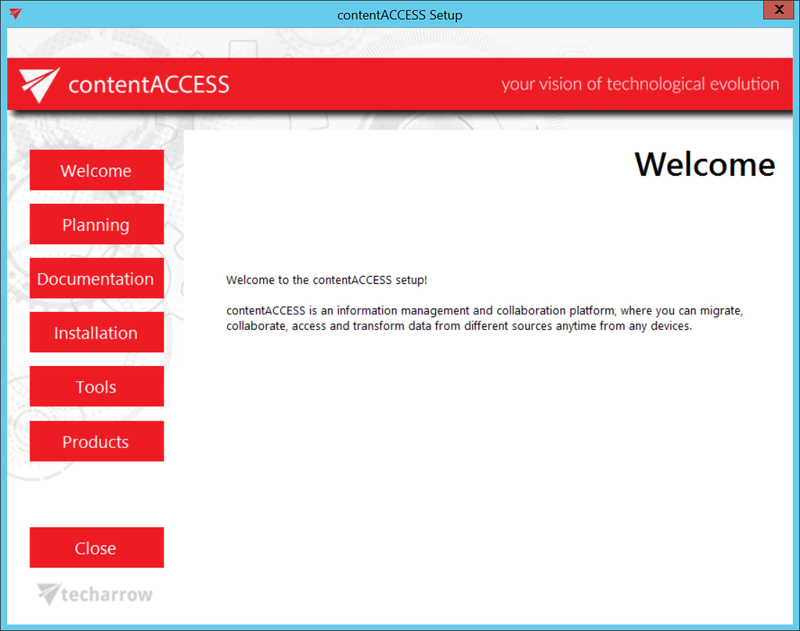 Now the contentACCESS installation wizard will open and it will lead you through all the steps of the deploying process. All components of contentACCESS can be deployed during this deployment process. Click Installation on the Welcome page. Important: Update is supported from contentACCESS version 3.1 and later. Older versions must be updated to contentACCESS 3.1 and then from version 3.1 to the latest version. If the update is done from an earlier version than 3.4, then as a result of some internal changes in the email archive shortcut format, the Outlook forms must be updated to the latest version to maintain the correct functionality.